I have been trying to cut down on meat. While I haven’t committed completely to vegetarianism for several reasons, I think it is a good idea to decrease our meat intake and increase our vegetable intake. Mr. Real Food still wants to eat meat so these burgers were my attempt to compromise and give him a burger but without actually giving him beef. As it turns out, this is a great alternative! You may want to experiment with your own seasonings but this is a great recipe to start with and can be made ahead of time and frozen for a quick heat meal or weekday lunch. Combine the lentils, eggs and salt. Stir in the onion. Stir in the bread crumbs and allow to sit a few minutes so the bread crumbs can absorb some of the moisture. 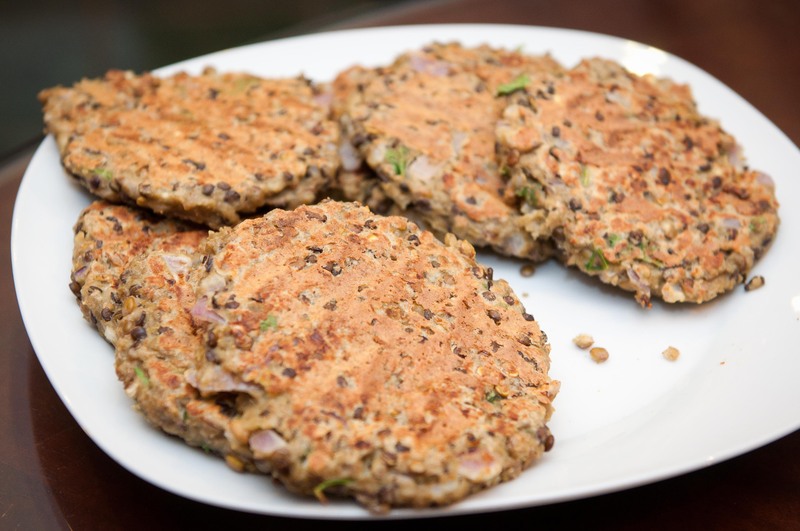 Form into patties (will make 6 big patties or 12 mini patties). 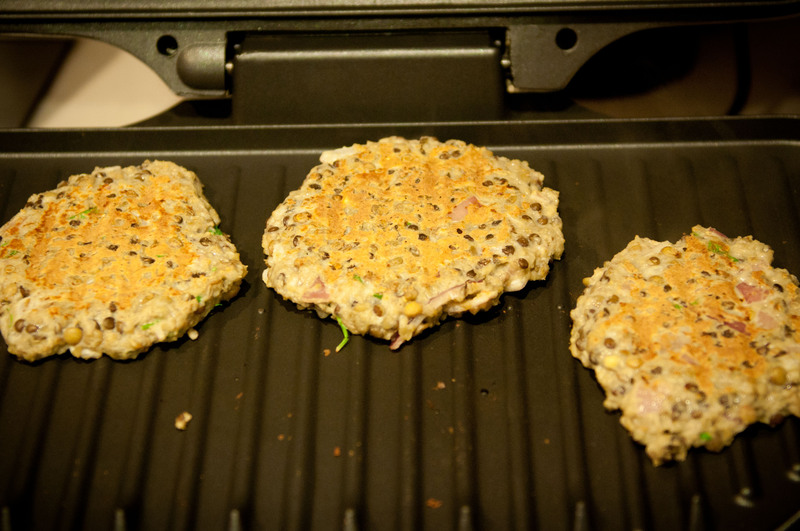 Heat the oil in a cast iron skillet over medium low and cook for about 10 minutes, until bottoms begin to brown. Flip the patties and cook until golden. Serve on whole wheat buns with your favorite burger toppings such as avocado, lettuce, tomato, and onion. Especially tasty with these burgers are roasted sweet potatoes. 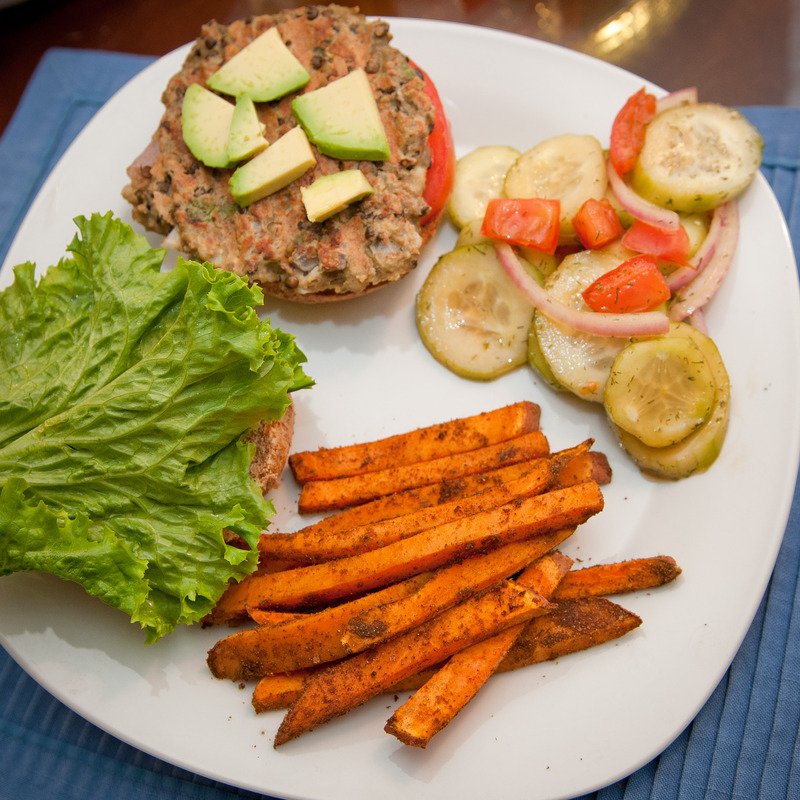 Sweet potatoes make this the perfect burger and fries combo! Meat is unhrsthy at a certain stage of a man’s life. Vegetables stand out more healthier. Your recipe is worth giving a trial and a 5star rating. I meant to write UNHEALTHY.